The philosophy behind Montessori products is that the learning environment reflects nature, with cause and effect. The materials are specially designed so that if the child does the exercise correctly, than the materials will reflect it, and if they do not, the manipulatives won’t work. There is no teacher to tell them that they’ve done it wrong, but instead they offer guidance. They demonstrate the correct way in the beginning, and then let the child learn on their own, at their own pace. If you have not heard of Montessori, you at least have seen her work, for many children’s toys are based on her original products. I really like the toys that she invented, and in our home we have incorporated some of her ideas. There is one big problem though. Oweing my due diligence to any philosophy I introduce to my children, I checked out Maria Montessori’s book, “The Absorbent Mind”. It became readily apparent to me from the first chapter that she was a socialist. This is easily confirmed if you search for “Montessori” and “socialism” on the internet. Sharing my political beliefs is beyond the scope of this website, but here it will suffice me to say that I am an ardent patriot in the tradition of our founding fathers. Socialism is a sharp contrast to that. I didn’t finish her book. I would never send my children to a Montessori school. This is a fair warning to any concerned parent. And yet, here I am sharing some of the activities we have done in our home. I suppose I don’t want to throw out the baby with the bath water. Her materials are superb for teaching, and I can see the benefits of doing these activities with my children. Here is the perfect activity for little boys who can’t keep out of Daddy’s toolbox. 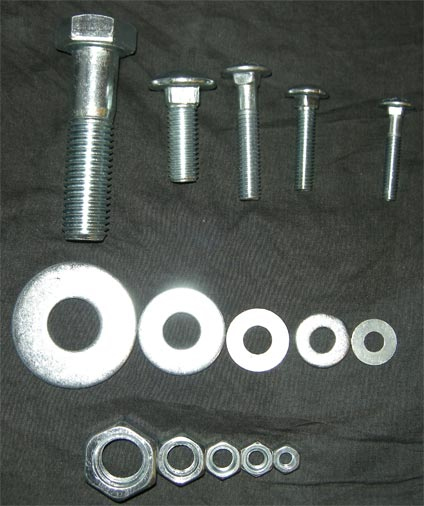 I went to Home Depo with Peter and purchased these different bolts with accompanying nuts and washers. The cost was $5.30, with the largest bolt taking nearly half of the expense. It was worth it, because the big one makes the whole set more attractive. Peter loves them and played faithfully with them the afternoon we purchased them, but in the end, I think he is a little young for this activity yet. He is only 25 months. I put it away and will bring it out again later. We looked and looked for a child-sized broom, and aside from very pricey ones in catalogs, we failed to find one. Then we went to the dollar store and Michael found a broom that had a removable handle on the top. He bought it and sawed it off, and now Peter "helps" me sweep all the time. Another couple of Montessori-esque things we've done is put his mattress on the floor. 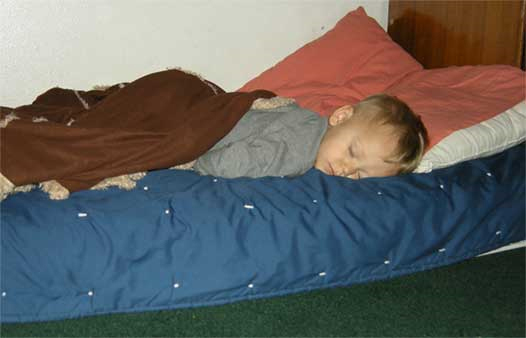 When he was really little, it helped him to be more independent because he would wake up from his nap and was able to come out rather than cry so we'd get him out of the crib or off our bed. 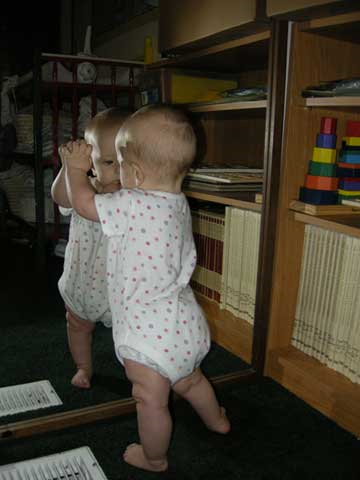 We also mounted a mirror we got from a thrift store on our wall when he was little. I didn't get those ideas from a Montesori book, but from a you-tube advertisement for a Montessori school for babies. We do a lot of beading excercises which Peter really loves. Montessori also recommends wood puzzles, which we do a lot of. I haven't made sand-paper letters, but I remember my mom taught me my letters with some that she made, and it made a big impression on me. I loved closing my eyes and guessing which letter it was. Peter already knows a lot of his letters so I probably won't make those. I highly recommend "Teaching Montessori in the Home" by Elizabeth Hainstock. This book tells you how to make and teach Montessori materials yourself. Also, we love the Melissa and Doug toys we have invested in. Many of them are modeled after Montessori's inventions. I like them because they are made of high quality wood and are built to last. My children love them too! Montessori was not a socialist. She was a fascist and a catholic. She was not American. She was raised catholic but left the church because disagreed with the teachings. She was socialist,feminist and humanist.